Over the next 3-5 minutes this post will cover an explanation of what CRO is, reasons for it being important and step-by-step methods you can implement for self-improvement for this aspect of digital marketing. CRO stands for Conversion Rate Optimization, and although it may sound complex it can be easily understood when broken down. First we must address what you as the business owner or Webmaster identify as a conversion. A conversion can range from moving from one page on a website to another, to filling out a contact form, or completing the online purchase of an item; basically a goal for a particular page. It is all about looking at the data when determining the rate. To do this you can use free tools from Google such as Google Analytics. 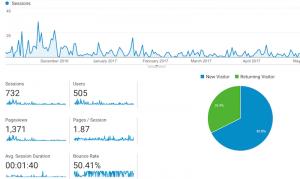 This tool will allow you to see how many people are visiting each page as well as the time spent on the page, and most importantly what they did while on that page. We will now need to incorporate the conversion into the rate section, and for simplicity sake let’s say that we are looking for a visitor to fill out a contact form. Now there are two numbers we need to look at, the number of people who are visiting the page and the number of contact form submissions received. Basic calculations can now be used to determine the conversion rate – # of submissions received / # of visitors to the page. Lastly, now that we have covered a conversion rate, we can get into the fun stuff that makes you more money, optimization. Express Writer’s explains that there are two main methods for optimizing CRO, testing various possibilities and pre-testing. 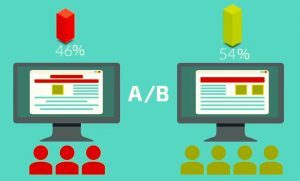 Testing various possibilities can easily be demonstrated through what’s called A/B testing. An example of this can be by creating two identical pages with the exception of a varied colored button on each saying to ‘click here to find out more’ (one button being blue and the other red). The next step would be to send half of the website traffic to each page, and then determine the conversion rate of each page. After completing the calculations you would be able to see what button color leads to the most conversations, allowing you to optimize that particular page so you can send all traffic to the most beneficial button color. Pre-testing focuses on completing market research upfront, then building the page(s) around that information. We have found that both strategies are effective; however, if you really want to see results it is best to take the time to utilize both methods, there is no such thing as a page that converts too well. We focus primarily on working with machine shops and manufacturers and from our clientele we have established three consistent major benefits delivered on CRO projects – improving sales and lead acquisition, getting the most from previous SEO campaigns and CRO being a low cost website upgrade when compared to other digital marketing strategies. This benefit should be the easiest to see since the purpose of CRO is improving the rate at which goals are reached, assuming the ultimate goal is to increase sales and lead gen.
SEO (search engine optimization) is a primary focus of all of our clients. The benefits of SEO are incredible, and will drive traffic to your businesses’ website, but once they get there everything needs to be in place to turn them from a visitor into customer. This is where CRO plays a key role. The trend for all marketing in business is that you get what you pay for; however this is not always the case. A decision maker could spend a fortune on paid ad campaigns, but could see equal increases in sales at a fifth of the cost. This is why we encourage CRO to be just as important of a marketing strategy as SEO. We at KriXis Consulting love to get more business, but as a thank you for taking the time to read this post we want to leave you with three do-it-yourself processes that can be implemented on your spare time to begin building a foundation for CRO success. If you are reading this I am assuming that you have at least one client under your belt. Now would be a great time to ask them to look over your website and see what would make things easier for them. 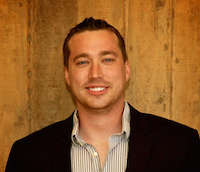 They may give you the best advice for some quick fixes to improve a visitor’s experience. We have all experienced websites where you get bored of reading through everything and before you even find what you are looking for you leave the page and see what someone else has to offer. Don’t be this website. Review the content on your website and see if you can make everything more concise and to the point. You would be amazed at the correlation between less text and more time spent on the page. The proof is in the pudding, and Google Analytics provides all the possible pudding (for your website data at least). Take some time and review what pages visitors are spending the most time on, as well as the pages with the least amount of time. See how they differ and try to mimic the design and layout of the pages with the most time spent. You should now have a better understanding of what CRO is, the benefits that it can provide for your business and how to create some of these benefits for yourself. If you really want to supercharge the CRO of your website click the button below.